In 1868, the United States government formally instituted Memorial Day as a national remembrance for the fallen soldiers from the Civil War of 1861-1865. Graves were tended and decorated, church services were held, and families and friends gathered to support the many veterans still in their midst. 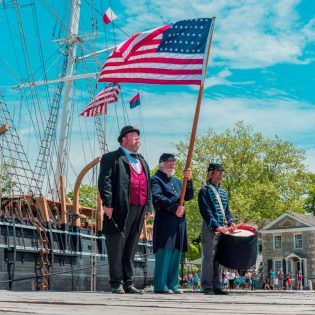 At Mystic Seaport Museum, our beautiful Decoration Day ceremonies may be set in 1876, but their reverence is timeless. In the morning, visitors are invited to the Fishtown Chapel to witness the memorials laid for local Civil War soldiers. At midday, amid the tolling of steeple bells, all are welcome inside the Greenmanville Church for a brief service complete with sermon and hymns. A colour guard leads everyone to the waterfront, where wreaths are laid for the artillery and the infantry. As the procession reaches the end of Middle Wharf, a bugler aboard the Charles W. Morgan begins “Taps,” which concludes with a wreath-laying for the navy and a three-gun salute from the Joseph Conrad. Every participant, staff and visitor alike, is then offered a flower to strew upon the river in memory of their own lost soldiers from any century. In the afternoon, a special presentation by the Chantey Program Staff illustrates the different roles of music on the home-front, in camp, and on the field – or sea – of battle during wartime. The day’s observances conclude in the Sailors’ Reading Room with a discussion of the long-term repercussions of war on 19th-century Mystic and its residents. 10:15 a.m.: Please join us in the Fishtown Chapel to witness the memorials laid for local Civil War soldiers. 12 p.m.: All are welcome inside Greenmanville Church for a brief service complete with sermon and hymns. A colour guard leads everyone to the waterfront, where wreaths are laid for the artillery and the navy. 1 p.m.: Join the musicians of the Museum’s Chantey Program for a presentation that illustrates the different roles of music on the home-front, in camp, and on the field – or sea – of battle during wartime. 3 p.m.: The day’s observances conclude in the Seamen’s Friend Society Reading Room with a discussion of the impact of war on 19th-century Mystic’s residents as well as on the people who portray them at the Museum today.